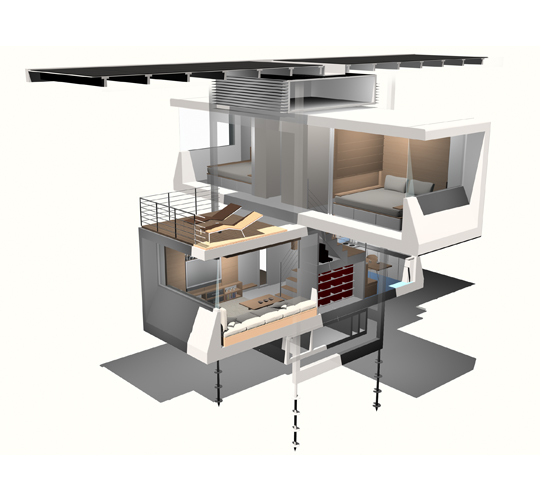 Continuing the theme of the last post – about the sources of alternative energy – today we will tell you about the new concept of eco house designed by american architect firm Specht Harpman – ZeroHouse. It is interesting not only for its unusual appearance, but also by the fact that it is fully automated, and can exist completely independently, without depending on outside sources. 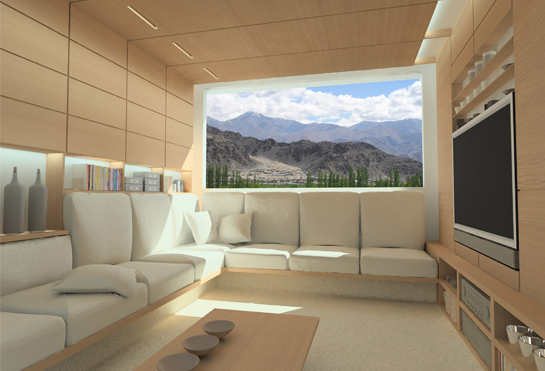 Wide roof covered with solar panels, and part of the accumulated energy will be stored in special batteries, so nights and cloudy days will not be a problem. Fresh water collected from rains will kept in 2700 gallon cistern under roof. And thanks to the pressure it will descend into the house through the pipes without pumps. Toilets will be connected to the compost container in the basement, where all the organic waste will be converts into clean, dry compost that needs to be removed only twice a year. 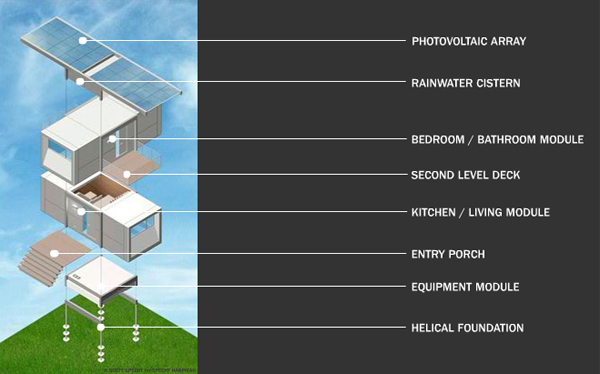 ZeroHouse can be called "smart house" because of it’s completely automatic. All functions of the house are monitored by an array of sensors, and regulated by a "house brain" that can be controlled trough any laptop computer. 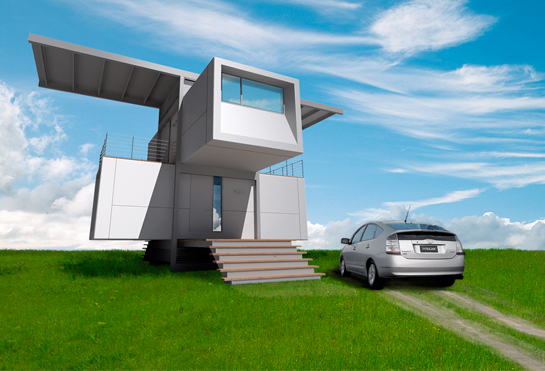 This eco concept house has all elements necessary to comfortably support four adults. 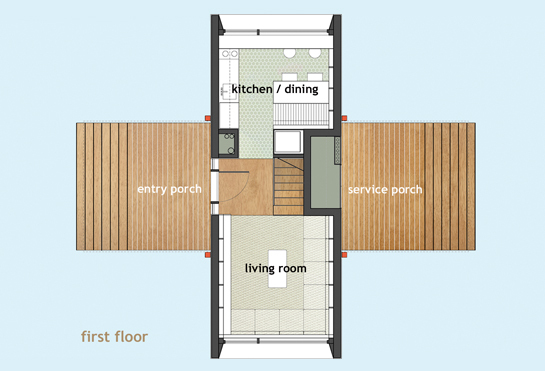 Each ZeroHouze contains living-room, kitchen, full bath and two bedrooms. 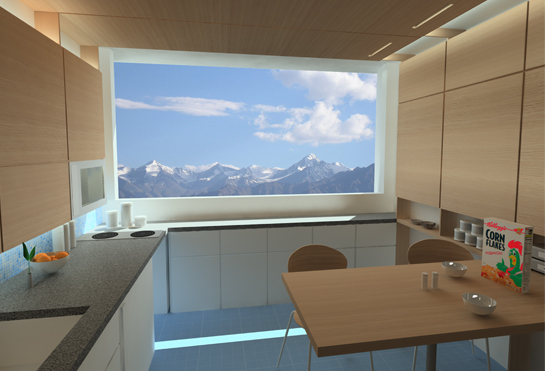 Cabinetry and wall panels are pre-finished wood, and never require painting. Also house will be equipped with LED-lamps built into the wall and ceiling panels, they will last for up to 100,000 hours of continuous use. 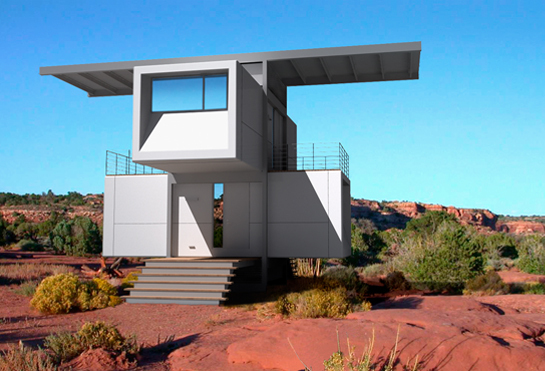 If all this really works as intended, this house could be build even in the desert, even on a mountain top, because the zeroHouse operates in dependently off-the-grid, without the need for any external utility or waste disposal connects. 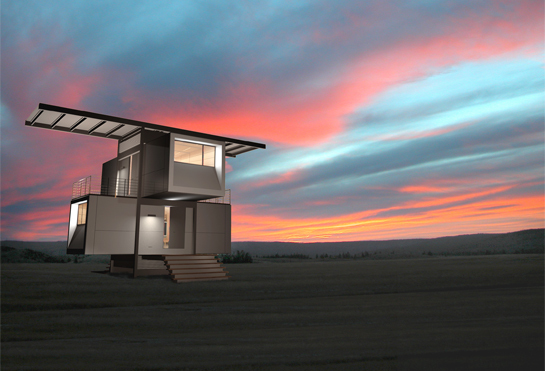 And also you can check 15 Prefab Shipping Container Home Builders. the rainfall wouldn’t be enough in the desert to provide enough water for an individual much less a family. However, I love the idea of it being self-contained and self-sufficient. 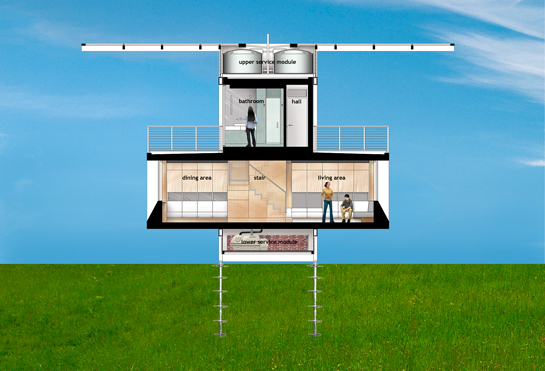 Very interesting concept, i wonder if they re-arranged the shower, how many more floors the structure could support. 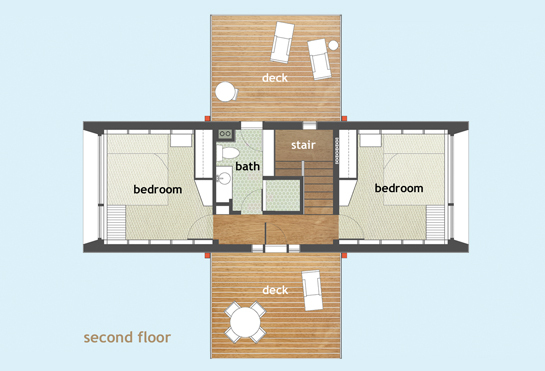 I would add 1 more floor to have a studio and playroom, with. The only issue i see with the autonomous house, is that you depend on rain fall and sunshine. i love the simplicity of the design. Very well put together also. I love this site so far, all cool things to see. love it. 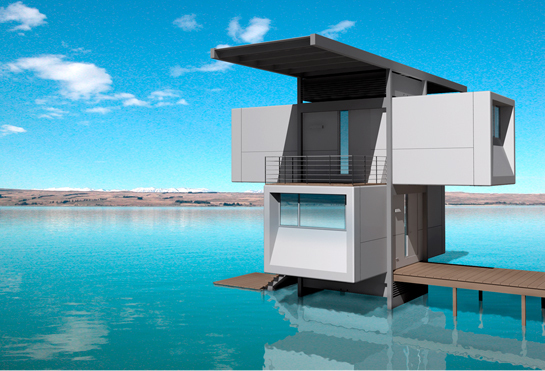 i’d move right in. 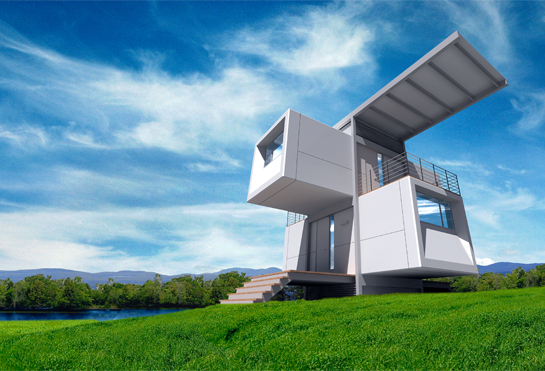 Wow, in the future people will live in stacked shipping containers!